Because Counting sort algorithm creates a bucket for each value, an imposing restriction is that the maximum value in the input array is known beforehand. Once every value is inserted into the bucket, you just go through count array and print them up depending upon their frequency. For example, if the input array contains 0 (zero) five times then at the zeroth index of count array you would have 5. Now, you can print zero 5 times before printing 1 depending upon its count. This way, you get a sorted array. Btw, there is a large number of counting sort algorithm implementation code on the Internet, including on university websites, that erroneously claim to be bucket sort. There is a key difference between Bucket Sort and Counting sort, for example, Bucket sort uses a hash function to distribute values; counting sort, on the other hand, creates a counter for each value hence it is called Counting Sort algorithm. You can further check a comprehensive course like Data Structures and Algorithms: Deep Dive Using Java to learn more about it. 1. Since the values range from 0 to k, create k+1 buckets. For example, if your array contains 0 to 10 then create 11 buckets for storing the frequency of each number. This array is also called a frequency array or count array. 2. To fill the buckets, iterate through the input array and each time a value appears, increment the counter in its bucket. 3. Now fill the input array with the compressed data in the buckets. Each bucket's key represents a value in the array. So for each bucket, from smallest key to largest, add the index of the bucket to the input array and decrease the counter in the said bucket by one; until the counter is zero. Time Complexity of the Counting Sort is O(n+k) in the best case, average case and worst case, where n is the size of the input array and k is the values ranging from 0 to k. If you want to learn more about how to calculate time and space complexity of an algorithm, please see a fundamental course like Algorithms and Data Structures - Part 1 and 2 on Pluralsight. Btw, even if you don't have a membership, you can access this course for free by making use of their 10-day Free Pass which allows 200 minutes of free access to all of their quality online courses. You have given an unordered list of repeated integers, write a Java program to arrange them in ascending order. * Java Program sort an integer array using counting sort algorithm. 1. Is counting sort stable algorithm? 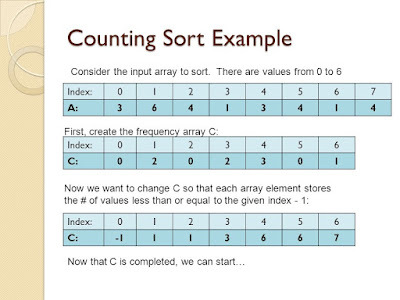 Yes, The counting sort is a stable sort like multiple keys with the same value are placed in the sorted array in the same order that they appear in the original input array. See here to learn more about the difference between stable and unstable sorting algorithms like Mergesort (a stable sorting algorithm) and Quicksort (unstable sorting algorithm). 2. When do you use counting sort algorithm? In practice, we usually use counting sort algorithm when having k = O(n), in which case running time is O(n). 3. Is counting sort in place Algorithm? 4. How does counting sort works? As I said before, it first creates a count or frequency array, where each index represents the value in the input array. Hence you need a count array of k+1 to sort values in the range 0 to k, where k is the maximum value in the array. So, in order to sort an array of 1 to 100, you need an array of size 101. After creating a count array or frequency array you just go through input array and increment counter in the respective index, which serves as a key. For example, if 23 appears 3 times in the input array then the index 23 will contain 3. Once you create frequency array, just go through it and print the number as many times they appear in count array. You are done, the integer array is sorted now. 5. Is counting sort, a comparison based algorithm? No, the counting sort is not a comparison based algorithm. It's actually a non-comparison sorting algorithm. 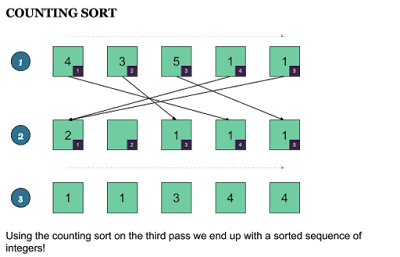 See here to learn more about the difference between comparison and non-comparison based sorting algorithm. 6. Can you use counting sort to sort an array of String? No, counting sort is an integer based sorting algorithm, it can only sort an integer array or number array like short, byte or char array. That's all about Counting sort in Java. This is one of the useful O(n) sorting algorithm for sorting integer array. the linear sorting algorithm is a useful concept to remember, they are very popular nowadays on interviews. A couple of other linear sorting algorithms are Bucket sort and Radix sort. Just remember that you can only sort integer array using counting sort algorithm and you need to know the maximum value in the input array beforehand. Thanks for reading this article. If you like this article then please share with your friends and colleagues. If you have any question or suggestion then please drop a comment and I'll try to find an answer for you.